The aim of the Burj 2020 master plan is to create an integrated design accommodating the world’s tallest commercial tower, enhancing the Dubai brand in general and that of the Jumeirah Lakes Towers development in particular. 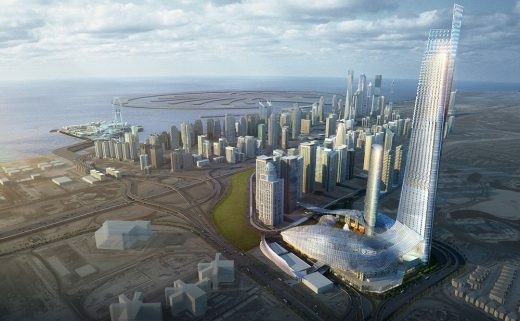 The tower is to be completed in advance of Expo 2020 Dubai, an event that will draw significant international attention to Dubai and the UAE. The combination of the location, function and need represent an opportunity to craft a destination that is both familiar and unique, unlike anything currently existing in the region. 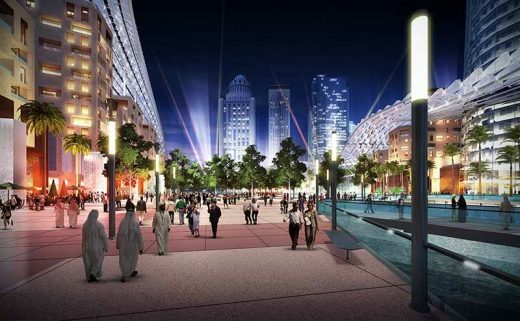 The vision is to create a gateway to Dubai that is iconic, diverse and of significant value to the greater community. This can be done by adhering to four root principals. Community – Intent, belief, resource, preference, needs, courtesy, sensitivity and respect. These are the elements of community. The compact nature of this location combined with the large program requirements presents the opportunity to create a mixed use community that exists nowhere else in Dubai. Connectivity – making connections logistically (multi-model), economically (desirable business center) and personally (culturally rich experience). Sustainability – to go beyond just “sustaining” and becoming a source of regeneration. Opportunity – the compact development and mix of uses will present cross pollination and open new avenues for economic, social and cultural development. The project creates a significant new gateway to this growing international city. 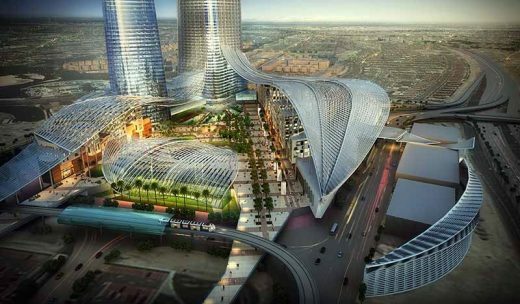 The development of the new Dubai World Central – Al Maktoum International Airport at Jebel Ali, which is planned to be fully operational in time for Expo 2020 Dubai, will change the manner in which visitors approach and enter the city. 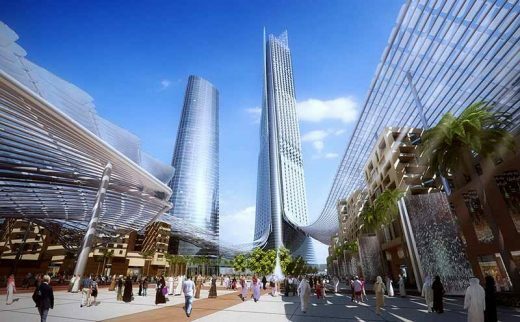 The 700-metre tall Burj 2020 will offer a new landmark within the city, becoming a significant skyline element. 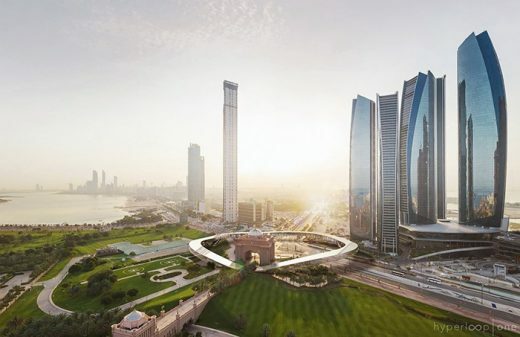 The creation of an observation deck at the highest accessible location within the tower, at a height of 580 metres, offers the opportunity to create the highest observation deck in the world, an attribute that will further enhance the landmark aspect of the project. 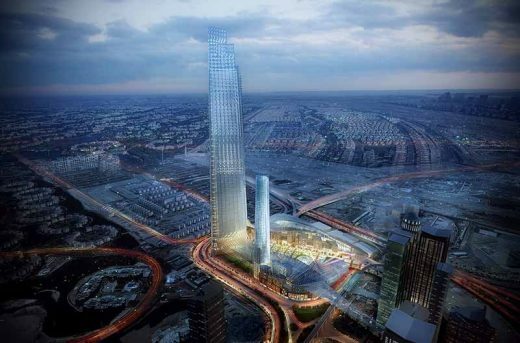 The placement of the tower on the site has been shaped by consideration of the views from Sheikh Zayed Road, the existing towers within JLT, the Dubai Eye and from within the public realm. In considering the parallel at Downtown Dubai, the majority of photo opportunities are realized on and around the bridge linking Dubai Mall with the Old Town area. The distance from this point to Burj Khalifa is approximately 330 metres. In considering the placement of the tower on the Burj 2020 site, the eastern corner is most favourable in meeting all the viewing criteria from the road, pedestrian and adjacent building perspectives, ensuring enhanced landmark performance. In addition to the tower, the master plan envisages the creation of a unique new destination within the city – expanding on the principles and values that have made Downtown Dubai a distinctive destination and international landmark. The diversity of land uses and arrangement on the site aims to optimize the development value and to enhance absorption of development product. Blending employment, a range of living choices, diverse shopping opportunities that includes independent retailers that are possible as a result of the free-trade status of the site, hotel visitors and integrated cultural uses will combine in a dynamic, 24/7 urban environment. The public realm will reinforce the qualities of the desert oasis, combining textured shade through a combination of planting and building structure, dynamic water elements and a range of public and semi-public landscaped spaces for residents, workers and visitors to enjoy. Ground level entry points to the development will be marked with palm grove planting with tight spacing, offering a deeply shaded environment reminiscent of the oasis. 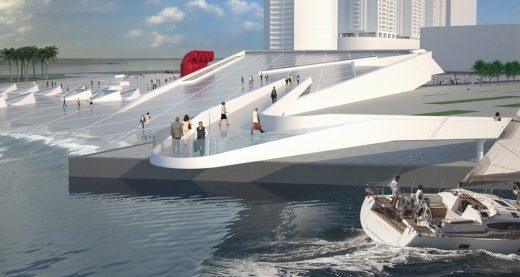 Water walls will be used between the upper level plaza and ground level, generating a vibrant quality and creating white noise to further enhance the special quality of the spaces. Elevators will pass in front of or through the water walls, taking visitors to the upper level retail plazas.